Hello, and welcome to my review of the Alpen 8×25 Sport Compact Monocular. Alpen is relatively new to the field, having been established in 1997 to produce binoculars, spotting scopes, rifle scopes, and accessories. I’m always eager to try out products from new manufacturers, so let’s see how this one compares to the competition. This model measures just 4.75 inches long, and weighs a mere five ounces. You can easily carry this in your pocket, but it does include a carrying case for attaching to your belt or backpack. The objective lens is 25mm in diameter, and the eye relief is quite long – I’d estimate it to be around 15 to 17mm. The wrist strap and carrying case are decent, but nothing to write home about. They do their jobs well enough, though. The instruction manual is almost useless, and fails to explain that the eyecup rotates in and out for use with or without eyeglasses. Through its 25mm objective lens, you can use the Alpen Sport Compact Monocular to get a view with 8X magnification. The magnified image has plenty of sharpness and clarity, but the fact that this glass is so lightweight makes it difficult to keep hand shake out of the equation. One downside to this model is the tiny field of view. You won’t see more than about 150 feet at 1,000 yards, unfortunately. The real drawback here is the lightness of the monocular paired with the magnification power. It’s almost too powerful for such a tiny monocular, and hand shake is a definite problem when using this glass. You’ll find yourself having to lean up against a tree or other sturdy object to get a steady view. How Good Are the Optics on this Monocular? Alpen didn’t spare expenses on the optics for this glass. Instead of the cheapter BK–7 prisms, you’ll find premium BaK–4 prism glass in the roof prism design. Going a step further, the optics are even fully multicoated to provide as much light transmission and clarity as is possible through such a small accessory. The Alpen is easy to focus one-handed, with a rotating wheel that offers enough resistance to keep you from accidentally moving it while still allowing the focus to move smoothly. The image is very clear and vivid, with lots of contrast. 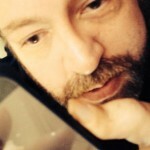 I didn’t notice any chromatic aberration, such as blue fringes, nor did I observe any distortion in the view. 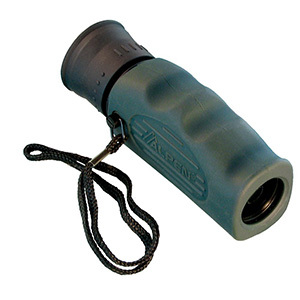 This particular monocular is completely encased in rubber, allowing it to be quite shock resistant. It is also slip-resistant, so you shouldn’t have a problem keeping a hold of the glass, even when your hands are wet. Unfortunately, it does not include lens or eyepiece covers, and it doesn’t have a tripod mount. This sporting glass may be inexpensive, but it’s not cheaply made. The rubber exterior provides plenty of protection against bumps and falls, and the manufacturer has taken the time and expense to make the optics waterproof and fogproof. In other words, O-rings seal out dust and water, and the optic chamber is nitrogen purged. How Well Does the Alpen 8×25 Work in the Field? This is a small enough monocular that you can’t complain too much about it, but I will anyways. In the field, it’s really only useful if you can prop your elbow against a solid object to minimize the hand shake. Alpen honestly should have stepped down the magnification a few notches with this model. Thanks for reading my review of the Alpen 8x25 Sport Compact Monocular. This is a piece of glass that could provide you with an excellent view if it were heavier (or if you have extremely steady hands). Unfortunately, hand shake is a pretty serious problem, which is a shame considering the quality of the optics otherwise.